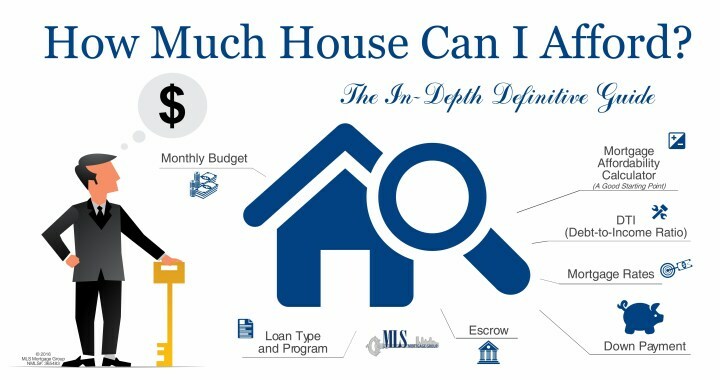 Home Affordability Calculator Reveals what a Lender thinks you can afford AND how much House You can Afford based on what you Want to Pay per month. Buying a house? The first question is to determine how much you can reasonably afford. That is a complicated question. Unfortunately, there's no set value for buying without looking at your whole financial situation. A Mortgage Affordability Calculator will give you a good idea. Use our Mortgage Affordability Calculator now. With our calculator, you can get an approximate purchase price (and amortization schedule) for buying a house, when contemplating a certain monthly payment. Or, if you have a certain price in mind, it will tell you the monthly payment required for that. It will even tell you the annual household requirements required for those numbers. Where it gets a little tricky is when it is estimating from your monthly income. That's when the calculator is not a definitive guide. The calculator doesn't take variables into considerations that a Mortgage Broker will look at when they're considering your approval for a mortgage. In fact, it's just about useless when it comes to telling you what you can really afford. So, you may be wondering, why even reference it? The Home Affordability Calculator is great in terms of monthly payments. It also provides a good starting point when it is time to become a homeowner in 2017, for the reasons mentioned previously, but it is really just that - a place to begin. For an in-depth look, we included a Budget Calculator. Plus a Close-up look at the How Much House Can I Afford Worksheet. You'll have to checkout out the cool Mortgage Qualification Calculator to see how they really influence your home price range. Along the way, we have 7 handy tools and material to help you meet your home-ownership aspirations. From purchasing the home you desire, to keeping a reign on your monthly budget, to paying off your home loan early. Bonus Downloadable Worksheet! Approve is not the same as afford. During your mortgage pre-approval process, you may be approved at a higher home value than you know you can afford. That’s where your personal budgeting is vital. Now that we’ve addressed that, let's get started. First off – the reason a ‘how much can you afford calculator’; isn't the solution. Most calculators take into consideration specific Debt-To-Income (or as those in the industry call it – DTI) Ratios. In most cases (including ours), they calculate from an old-school percentage of 28/36% Conforming DTI. Government mortgages have never followed those figures; theirs are discussed in the financing section later. Not to exceed 36 percent has long been considered the rule of thumb (specifically, the 28/36%) for what someone can comfortably afford. Expert Advice has recommended to 1.5 to three times your annual income. That may or may not be feasible depending on your area. Those figures are a good starting point and/or budgeting figure when it comes to calculating your comfort level. Assumes 760 credit score, 3.25% mortgage rate for a 30 year Fixed Conventional Mortgage, no monthly debt besides housing PITI, 1% for property taxes and .5% for homeowner's insurance, and 36% DTI for your personal affordability budget. We’re in 2017 and most mortgage companies 'run your file through automated underwriting'. Those percentages may not even be a factor in their findings. 'What is automated underwriting?' An Underwriter is from the mortgage company, they review your whole financial picture and say "Yes, you're approved" (or not). Once your complete file is submitted to an underwriter to be reviewed, it's known as "in underwriting". With technology now, there are computer software algorithms in place that look at your whole financial file and the software issues a decision of whether you are likely to be a good borrower or not. If you get the green light, you're most often good to go (assuming you meet the requirements outlined in the underwriting findings). The software reviewing your financial file is called "automated underwriting". A real human still double-checks everything, but that initial green light paves the path for an easier approval. Okay, we've mentioned DTI a few times, but we hear you: 'What exactly is a Debt-to-Income percentage, and what affects does it have on what I can probably afford? All of your minimum monthly debt, plus your monthly home costs, divided by your monthly gross income. To continue our scenario, if your desired total home costs are around $1500/month, your bottom/back-end ratio would be 51.39% ($350+$1500=$1850/$3600=51.39%) - According to our Home Affordability Calculator, since the bottom is above 36% (the 36 rule), you wouldn't qualify for home financing. 41% DTI for USDA Loans (USDA Rural Development). If you are not obtaining a VA home loan to finance your home, and have little money down, it may allow you to afford more of a home (than USDA Rural Development and/or a Conforming) due to the greatest DTI thresholds. In relation to our example earlier, if you've already been making payments around $1,500 (That helps! ), and you manage credit well, the automated underwriter may not accept a conforming mortgage (see the previous DTI), but you might be approved for a government loan. The Mortgage Broker may determine that you qualify for more than you're comfortable with - don't worry about that number. In many cases, you may want to decide on a DTI that will gift you more breathing room and additional funds to save for emergency expenses (and home repair emergencies). Lowering the payment will also assist to maintain your desired lifestyle, living expenses, household repairs (the CEPR estimates you should figure 1/12 of 1% of the purchase price per month for that), household expenses, entertainment, and other saving desires such as retirement, or fun expenditures. NEVER let anyone talk you into higher payments than you're comfortable. Taking a look at your finances should be your first step. Then, use a mortgage qualification calculator to see what you can borrow. As mentioned previously, for an in-depth look, utilize our Budget Calculator. It’s provides the basics, and assists in financial health. Alternatively (or in addition to), think about what your current rent - are you hoping to pay the same when you buy a home? Would you feel comfortable paying more than what you're paying now? If you are renting and not purchasing this month, and you’d like to buy a home for more than your rent, you may want to Practice your Payment. Take the difference of your present housing expense, and the future one, and place it into an investment or savings account. To be able to access the money easily, use accounts that don’t have a penalty for withdrawal. Allocate what you have saved for an emergency fund, your down payment, or for decorating your new home. Your added reserves will help your qualification and you'll sleep better at night, knowing you really are comfortable paying that, month after month. As mentioned, that would have the Homeowners Association (HOA fee) maintenance fee if there's an association. Annual taxes and insurance can vary greatly from one home to the next. You’ll notice even more of a change if you're moving to the city versus the suburbs or another county. City lines can dramatically influence property taxes. Homes that have been improved without realizing the tax increase yet, improvements, tax levies, distance to a fire hydrant (influences home ins. ), and schools. All of that (and more) has a significant influence on taxes and insurance. And it's a larger variance because the taxes and insurance payments are annual figures. Since they’re only spread out over a year, the monthly tax and insurance costs are more noticeable. On the other hand, mortgages are often spread out over 30 years. Ask your local expert (REALTOR ® or other.) for figures for estimated taxes and insurance for your area. To be on the safe side, add more as a cushion. Better to be over, then under. Your down payment has a few effects on how much you can afford. Although, maybe not as much as you may think. Test changing your down payment in a mortgage payment calculator to see its effect on your monthly house payments. 5% was still not enough for conventional financing. Since it’s so close, it may be tempting to use a discount point to qualify. Please keep in mind, a re-pull of your credit could be a negative impact. Your insurance or taxes coming in higher could remove you from qualifying. It’s risky to be at your maximum qualifying capabilities. The monthly MI uses part of your monthly housing allowance. Most Qualification Calculators don't even factor in mortgage insurance - there are just too many factors to calculating your individual MI factor - the cash you have down, what your credit score is, the mortgage insurance provider, and even the mortgage lenders! They also don't consider the down payment (in relation to MI) - if mentioned, it's generally to estimate your maximum financing price based on the money you put down when you buy. If you're at your max DTI limit, mortgage rates can be a factor. Check out this Mortgage Qualification Calculator to see home interest rates’ effect on how much you can afford to borrow. That mortgage calculator shows the maximum home loan for 6 different rates all at once! Here, we begin to delve a bit into Mortgage Strategy. Often, we recommend a traditional 30 year home loan in relation to our home buyers wants/needs. But what if you're only planning on staying in the home for a couple of years? You're expecting a job change, or thinking of having a child, or have one that will be entering/changing schools, or, or - the reasons for not staying in your new home for 30 years is infinite. In fact, REALTOR ® surveys state that homeowners move on average every 5-7 years. We can appreciate the advantage of the certainty of fixed rates, especially the 30 year. We don't know what the future will bring (even if all signs are pointing in one direction) - so we like knowing that no matter what happens personally, we can count on our P & I housing payments remaining steady. Of course, monthly taxes, homeowners insurance (and association if applicable) will change, but there are no adjustments to the loan when you’re locked into the rates, like there can be with an adjustable rate mortgage (ARM), and as mentioned previously, the housing costs are steady for a home loan. If you, or your spouse, or anyone else that pays the mortgage with you, are laid off, you're not committed to a greater monthly housing amount. If you have two incomes now, contemplate life changes that may shift you to one. By figuring the lower monthly payment, life can be less bleak if the unexpected happens to families. You can apply more to your principal balance to pay off your mortgage early. If paying off your home early is a goal of yours, many people have had success utilizing an ARM and making larger housing payments (even just what their 30 year payment would be). Due to the lower interest, they pay significantly more down on their mortgage balance. That works really well if you think you may move before its originally due to adjust. Utilize this Early Mortgage Payoff Calculator to see the effect of that mortgage strategy. The important factor to consider with adjustable rate mortgages is that most banks will base your qualification off the fully indexed rate. The fully indexed rate is the initial rate + lifetime cap. For instance, if you're obtaining an ARM for 2.5%, steady for 7 years, with a yearly adjustment of 2% and a lifetime cap of 5% - lenders look at the start rate of 2.5% + the lifetime cap of 5% to obtain a qualifying rate of 7.5%. So even if you think you’re only staying in the home for 5 years, they will want to verify that if you do happen to stay in the home longer than 7 years (the fixed rate time-frame in our scenario) - that you'll have the reasonable ability to repay. In other words, they want to verify that you’ll be able to afford to stay in the home. So... How much house can I afford? In conclusion, the solution to your goals would be to first examine your personal finances and then use a Mortgage Calculator (find the one that's perfect for you). It’s a good place to begin because it gives you a monthly payment (or home price based on the monthly amount you choose). But really, it's a budgeting tool. It provides you with a flexible number. We do recommend the Home Affordability Calculator (below) when using the "Calculate for Total Monthly Payment" option - it will show you how much you can afford based on that monthly amount. It's a perfect place to get started. To get an accurate answer from lenders’ perspectives, you'll want to speak with a licensed Mortgage Broker. They will review your whole financial file, submit it to underwriting, review your credit, provide you with feedback, and determine what you can afford. If you want to begin the home purchasing process, you can start your mortgage pre-approval now. Feel free to begin with the calculator below first. Even if you're not buying for another 6 months, or a year, or more - still talk with a Mortgage Loan Originator (MLO) now. Your ideal MLO will act more as a Professional Consultant, giving you feedback on where you are now, and help create a plan with you to get to where you want to be. They should be free of pressure, and may even have mortgage reviews from their past clients. If the first person you speak with pressures you, try another, pressure-free MLO’s ARE out there. We know, because we're free of pressure. There's no reason to feel guilty if you speak with someone and you don't buy right away. Even though most MLO’s are paid on commission, if you come back to them when it’s time to buy, they will be compensated at that time. And if you tell your friends and family how friendly and useful they were, it's even better, and they're even more appreciative. In summary, contact a licensed Mortgage Broker now, so when you're ready to buy, you actually are, ready to buy a home. If you found any of this article helpful, please help someone else by sharing it on your favorite social network! Posted in Buying a House, Credit, First Time Home Buyer, How Much House Can I Afford, Mortgage, Mortgage Broker, Mortgage Calculator, Mortgage Questions, Mortgage Rates, Mortgage Strategy and tagged FHA Loan, how much house can i afford, Mortgage Calculator, Mortgage Questions, USDA loans, VA Home Loan.